1848 Presidential campaign banner for the anti-slavery Free Soil ticket, entitled ''Grand Democratic Free Soil Banner''. Banner features the jugate portraits of Presidential candidate and former President Martin Van Buren and his running mate Charles Francis Adams Sr. (son of John Quincy Adams and grandson of John Adams). Lithograph printed by famed lithographer Nathaniel Currier is hand-colored in shades of yellow, blue, teal and grey, reading ''Free Soil - Free Labor - Free Speech'' at top. 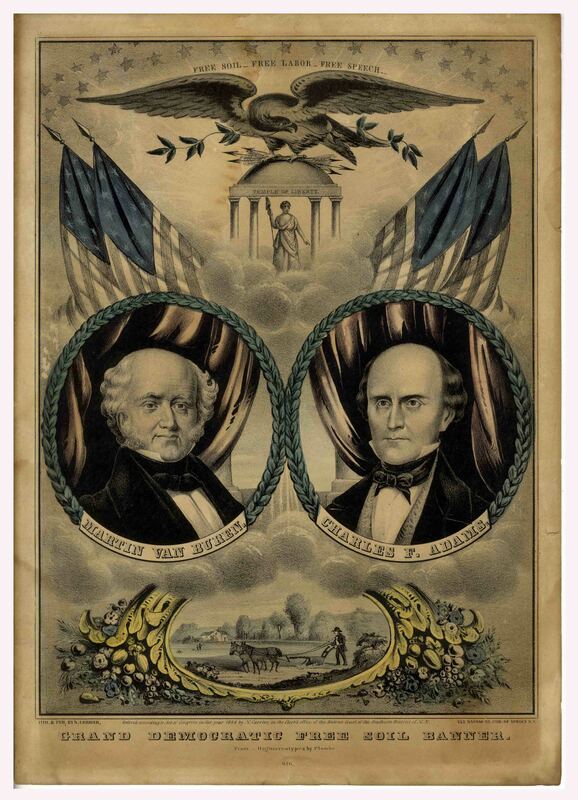 The Van Buren-Adams ticket was a faction of the Democratic party, opposed to slavery; it took enough votes away from the pro-slavery Democrats headed by Lewis Cass to swing the election to Whig Zachary Taylor. Lithograph measures 10'' x 13.75''. Some toning and light dampstaining (more visible on verso), and a few small chips to edges. Overall in very good condition. A nice Presidential banner from the turbulent Presidential elections of the mid-19th century, with the issue of slavery front and center.